Dear Editor-in-Chief We read with interest the study by Khazaei et al. (1) in which the authors have nicely concluded that PCR is more sensitive test than Ziehl-Neelsen staining and histo-pathological examination for the diagnosis of tuberculosis (TB). They have rightly pointed to use PCR, selectively, in acidfast bacilli negative paucibacillary forms of TB. However, we intend to highlight few points regarding PCR which may add to practical applicability of the study. PCR detects mycobacterial DNA in specimens and does not represent disease activity which is important for diagnosis of tuberculosis. Due to inadvertent exposure to the environment, relevance of PCR in pulmonary specimens is debatable. In the study, 12 patients (41%), positive for acid fast bacilli (AFB) by ZiehlNeelsen stain, were negative by PCR (1). This raises serious concern regarding the credibility of the test and needs to be discussed. Culture for tubercle bacillus is the only gold standard investigation for diagnosis of TB. The presence of granuloma on histopathology is quite suggestive for TB. However, it should always be differentiated from other granulomatous pathologies like sarcoidosis which can also present with positive PCR for Mycobacterium tuberculosis(MTB) (2). In the study, 16 subjects had non-caseating granulomas out of which 11 were positive PCR for MTB (1). Now, whether they were really having tuberculosis, is questionable. In the absence of culture, response to anti-tubercular treatment is a good surrogate marker for tuberculosis confirmation. It would be useful if authors mention the treatment response in their subjects and correlate it with PCR to reestablish its diagnostic value. As concluded by authors, PCR is a sensitive test for diagnosis of paucibacillary tuberculosis, but pending limitations, it should always be interpreted in light of relevant and comprehensive picture. Acknowledgements The authors declare that there is no conflict of interests. Khazaei S, Izadi B, Zandieh Z, Alvandimanesh A, Vaziri S. Comparison of Polymerase Chain Reaction, Ziehl-Neelsen Staining and Histopathologic Findings in Formalin-fixed, Paraffin-Embedded Tissue Specimens for Diagnosis of Tuberculosis. 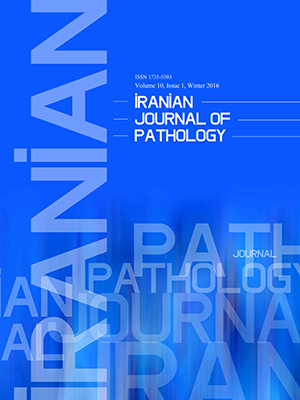 Iran J Path 2014; 9(3):208-14.